Ann Arbor District Library board meeting (Oct. 15, 2012): In their last meeting before the Nov. 6 election, board members got an update about the campaign to support AADL’s bond proposal for a new downtown library. That update came from Ellie Serras, who leads the Our New Downtown Library campaign committee. She had briefed the board previously at its Aug. 20 meeting. If approved by voters on Nov. 6, the $65 million, 30-year bond proposal will fund the demolition of the existing library at 343 S. Fifth and the construction of a new building on that same site. Speaking during public commentary, Serras catalogued the number of yard signs, buttons, postcard mailings, meetings and other efforts of the campaign. She described the campaign as being built on trust and confidence, “not rumor and innuendo,” and said the new library will be an expression of the community’s core values of education and equal access for all. Serras received a round of applause from board members after her remarks. The other item tangentially related to the bond proposal was the uncharacteristic absence of AADL director Josie Parker from the meeting. Board president Margaret Leary reported that Parker was attending two separate township meetings that night to talk about the bond proposal. For the most part, the AADL district mirrors the Ann Arbor Public Schools district. In addition to the city of Ann Arbor, the district includes parts of the townships of Pittsfield, Scio, Ann Arbor, Lodi, Webster, Salem and Superior. In addition to the bond proposal, there are four seats on the AADL board that are on the Nov. 6 ballot. Four incumbents – Rebecca Head, Nancy Kaplan, Margaret Leary and Prue Rosenthal – are running for re-election. The fifth candidate is Lyn Davidge, who attended the Oct. 15 meeting but did not speak during public commentary. For Chronicle coverage of a recent League of Women Voters forum on this race, see “Library Board Candidates Compete for 4 Seats.” While the four incumbents support the bond proposal, Davidge does not believe it’s the right project at this time. During the Oct. 15 meeting, the board also got a brief report on library finances. And Leary notified the board that Parker has been appointed by Gov. Rick Snyder to the Michigan Commission for Blind Persons, an advisory group for state programs and services. The AADL administers the Washtenaw Library for the Blind & Physically Disabled. By way of background, there are now four campaign committees related to the AADL bond proposal. The Our New Downtown Library committee was the first to form, and supports the effort to build a new library. The other three committees oppose the new library project. A group called Protect Our Libraries formed in September with Kathy Griswold, a former member of the Ann Arbor Public Schools board, serving as treasurer. Douglas Jewett formed a committee called Save the Ann Arbor Library. He is opposed to demolishing the existing building, which he views as architecturally significant. The original portion of the building was designed by Alden B. Dow. A third committee – called “LOL=Love Our Library” – filed earlier this month. 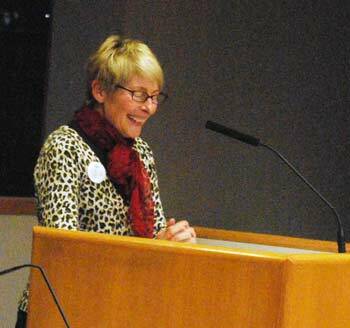 Its treasurer is Sheila Rice, who is also a board member for the nonprofit Friends of the Ann Arbor District Library. FAADL supports the bond proposal. Several AADL board members wore buttons supporting the bond proposal for a new downtown library. Serras pointed to 30 testimonials from community leaders that are posted on the campaign website. She reported that 500 small yard signs have been distributed, and 25 large signs will be put up soon. Over 35,000 postcards have been mailed, and another 10,000 will be sent out in the next two weeks. Three hundred campaign buttons have been given out, and the committee has reordered more. Members of the campaign have attended 14 events, done two radio interviews, and written opinion pieces for local media. More events are planned, she said, and volunteers are eager to add more to their calendar. Advertising is being placed in the local media, and volunteers are working at the Ann Arbor farmers market to talk to people about the proposal. This campaign is built on confidence and trust, Serras said, ”not rumor and innuendo.” Data that’s been collected by library staff – described by Serras as “astute” – make arguments for the proposal all the more powerful and persuasive. It’s clear that the downtown library is booming and that it can’t accommodate the community’s needs, she said. She said the new library will be an expression of the community’s core values: education and equal access to everyone. It will be an exciting place, she said, where ideas collide and and innovation explodes. Serras commended the board for its leadership in putting this initiative forward at this time. She said it was an honor for her to be part of an advocacy group for this great institution. Board members gave Serras a round of applause after her remarks. Nancy Kaplan asked how people might contact the committee to get involved. Serras directed people to the campaign’s website, noting that you can post a comment or email her directly. The campaign can arrange for someone to attend a meeting or meet with people individually, she said. Board president Margaret Leary noted that none of the board committees had met since last month’s meeting, so there was nothing to report. 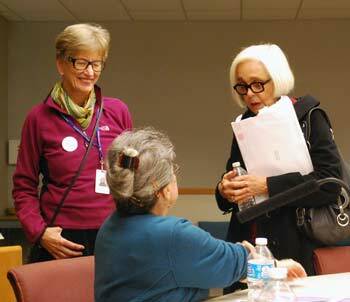 From left: AADL board members Prue Rosenthal, Barbara Murphy (seated), and Jan Barney Newman. She observed that AADL director Josie Parker was absent, and reported that Parker was meeting with groups in two townships that same evening to talk about the Nov. 6 bond proposal. Leary also reported that Parker had recently been appointed by Gov. Rick Snyder to the Michigan Commission for Blind Persons, an advisory group for state programs and services. The AADL administers the Washtenaw Library for the Blind & Physically Disabled. Leary said the appointment is an honor for Parker and AADL, reflecting her commitment to high-quality service and AADL’s willingness to take on the WLBPD when Washtenaw County government decided they could no longer administer it due to budget cuts. The county board of commissioners approved eliminating support for the WLBPD in late 2008, estimating it would save the county about $500,000 by transferring services to the AADL. Ken Nieman – AADL associate director of finance, HR and operations – gave a brief financial update to the board. [.pdf of finance report] He noted that through the end of September, the library has received 77% of its budgeted tax receipts – or $8.646 million. AADL’s fund balance stood at $8.035 million as of Sept. 30. Board members had no questions for Nieman about the financial report. Although the Friends organization as a whole is financially supporting the new library campaign, there are a number of individuals also Friends of the AADL who share my view that, as proposed, this is not the right project. 1. Closing the downtown library for 2-3 years deprives residents of functions on which they have come to depend. While the library intends to operate from a downtown storefront, services will be limited and browsing the physical collection impossible. One might also ask what the library staff that have been assured their jobs will do during the closure. 2. As a child of depression era parents, I was taught to make the best use of everything we had. Destroying a useful structure just to rebuild it runs counter to what I believe which is that the library should plan for a renovation of the existing building structured in a way that does not require a lengthy closing period. A “NO” vote should not be seen as a vote against the library. Many voting against the proposal will be those who love the library, its collections, its staff and its programs. I believe that this bond proposal is misguided as to our true community needs and not professionally vetted as to all options for maintaining our present library for the future. We haven’t yet found the most cost effective project for the library. I also believe that the AADL board is out of touch with reality. Proposing a library which will require $130 million bonded payments to totally eradicate a present library building, which doesn’t have its debt paid off, is not a financially sound decision. This country is already in $16 Trillion of debt. Real wages aren’t keeping up with inflation. I wouldn’t be surprised if the AADL board members also pull the lever for Romney along with this proposal in the voting booth this Nov 6. Additionally I wouldn’t be surprised if the new library requirement of a 400 seat auditorium was removed from the project scope. A reasonable solution of renovation to the existing building could be designed at a cost less than $15 million. I will be voting NO and fervently advise everybody else to also. I find the history of this project deeply disturbing. The original motivation given to us by the Board was that the building was old and worn out and maintenance costs were high. That made no sense to me, as the building isn’t old enough to be worn out, and the maintenance costs are much lower than new construction costs. The 2007 Providence study gave cost estimates of $12 to $26 million to remodel, depending on whether you replace the oldest part of the building, on the Fifth Avenue side. The cost of a new building was $36 to $43 million. Either option would result in a building about the same size as the one we have now. Those costs obviously favor renovation. I don’t mean to question the motives of the Board. But the impression I get from all this is that the Board first decided they wanted a new building, then went looking for justification and a way to sell it to the public. If that’s not the case, I’d like to see an explanation. Finally, I’ll note that the Graduate Library at the University still has the stacks that were constructed in 1883. Much of the rest of the building was replaced in 1918, and is still in use today, almost 100 years later. It’s funny you mention the Graduate Library’s shelves, because I was just thinking about them the other day. I work in the Hatcher-Shapiro complex (though these comments are my own, of course, and not my employer’s), and I think the stacks are both a blessing and a curse. They were built in the 1880s, and were not designed to be a public, browseable space, but rather storage for library staff to access on behalf of patrons. They are super cool-looking, of course, and I’m glad that Hatcher has vintage library charm (an argument I don’t think you can make about the downtown Ann Arbor District Library). However, as the scholarly publishing environment continues to shift from print to digital, and as students look to us for study spaces, and the campus community and beyond for events, the stacks become more of a nuisance. The problem is that the stacks are load bearing, so even if the library wanted to preserve some of the charm and transform another portion of stacks area, it wouldn’t be able to do so without a major project. I guess the point I’m trying to make is that in my world at Hatcher-Shapiro, I believe we all want to be the library (and space) that our patrons need and want us to be, both in the current environment and in the future. As is often the case with beloved spaces, nostalgia gets in the way of making a sound, future-focused decision. It’s hard for libraries right now. Unless a library was built in the last ten years, it was built to do things that people don’t expect libraries to do as much any more: provide storage exclusively for books (so much so that the spaces are often heavily reinforced to accommodate the weight of books, making them more difficult to retrofit and transform!) There’s so much more that libraries do now, and it’s really wonderful, but it’s difficult to achieve our potential without the right spaces to grow in a new direction. I do think that it’s important to preserve our history and to look to the past as well as the future. However, because the downtown AADL fails (in my opinion) the historical charm test, I think it should be considered more on the basis of whether it can accommodate the needs of the library and of the community, both now and going forward. I have spent some of the happiest hours of my life in library stacks. Admittedly, not in the AADL or public libraries (usually), but in the course of research projects. There is a serendipitous aspect to stacks that simply will not be duplicated by digital access (though that has its own serendipitous character). One can find books in a related subject that might not be found simply by reading lists of citations. And the satisfaction of sitting in a monastic carrel within the stacks to plow through piles of volumes is hard to convey. I acknowledge that this nostalgia does not justify any particular configuration for a modern library. But my childhood Carnegie library (complete with many cats and a witchy old-maid resident librarian) was a place that I made many discoveries I would not have made without books on shelves, by categories. It revealed wonders. While it might seem that the library could be renovated at a lower cost, that is only the case if you forgo many of the improvements to the library that are the whole point of this project. There are two sides to the ledger. On the one side is cost, and on the other is the improved ability of the library to accomplish it’s mission, i.e. capability. Among the items on the capability side that are not possible in the current building: a youth area that can simultaneously accommodate open play and story times, a large quiet reading room, access to the local history collection (currently offsite), an auditorium for free lectures, film, performance and discussion, spaces that can handle messy hands-on programs like electronics workshops, a cafe, and more computing resources. Which of these things can be accomplished through renovation? It is clear from the 2008 process that the footprint of the current building cannot be expanded, and additional floors can’t be built on top. I have yet to mention that the current building has a number of fundamental problems aside from being unable to support the above capabilities – poor lighting, outdated HVAC, elevators and roof at end of life, and a fundamental design that is not accessible to those with disabilities (the elevator opens onto a descending staircase, for example). The only way even some of these capabilities could be added through a simple renovation is if you were planning to get rid of books. And that is something that I would never support. I’m a techie, but I’m with Vivienne: the books are essential now, and I think they will continue to be essential far into the future. The only way to have both the books and the above capabilities is with a new building. I’ve heard people say the greenest building is the one already standing. This is clearly not always the case. What if that building is inefficiently climate controlled and it isn’t adequate to a community’s needs? It’s not as though the current building is going to end up en masse in a landfill, as I sometimes hear. Rather it seems they plan to encourage as much reuse of those materials as possible. I would certainly think the bricks and cinder-blocks (most of the construction as far as I can tell) would be extremely reusable. I hear almost everyone say they love the library system, it’s services, and how it’s run. Why wouldn’t you trust the people who built that system into what it is, when they view a new building as the best way forward? The recently constructed branch libraries are beautiful, green, and built within schedule and budget. Interest rates have never been lower in my lifetime; now is the cheapest time to rebuild. This city is a university town. Our prosperity is based on education, and on attracting intelligent and creative people here to build businesses and families. We should be doing everything we can to accomplish that, and a downtown library people are excited about visiting is essential. I know I’m excited about it. I would ask Ryan “needs” or wants? Little of what has been proposed can compellingly be called a “need”. Most of the “needs” like HVAC, plumbing, bathroom accessibility could be accomplished in the context of the current building. What is compelling is the price tag for this project and the hardship on many taxpayers who don’t need any of the specious enhancements proposed. I want to respond to Sheila’s thoughtful concerns about the library bond proposal, though I am strongly in favor of rebuilding our downtown library. 2. Although I’m not a child of Depression-era parents, I too highly value efforts for reuse/recycling (I was actually featured for my packaging reduction efforts in The Chronicle in 2009: [link]). In the case of the downtown building, however, I agree with AADL that rebuilding is our most ecologically wise approach. The fact that rebuilding the downtown facility is supported by environmental/preservationist leaders in our community, including Mike Garfield, J.D. Lindeberg & Ray Detter (full list here: [link]), says a lot about the ecological merits of this approach. The alternative you propose would require a major renovation and shutting down of the building for as long, costing nearly as much, and leaving us with an inferior facility. 3. I see the cost of the library bond proposal as a significant, prudent investment in a critical resource for our community. A YES vote amounts to roughly a dollar a week to the majority of homeowners. A great downtown library will increase the long-term property value of tax payers and increase the AADL’s ability to provide value to area citizens, whether young, old, those with disabilities, low income or seeking knowledge, training, high speed internet or inspiration from art & culture. If you think a dollar week is too high, consider borrowing instead of buying a couple of books at the library, or replacing a magazine subscription or Netflix account with the library materials or attending one of the AADL’s many free lectures and events. A better library means more opportunities for everyone in our community to learn, share and save money. I believe a YES vote for the library bond proposal is a fiscally smart vote and a progressive vote for a more vital future of this community. With all due respect, Mr Harrison, there are thousands in Ann Arbor who have done away with paying for Netflix, magazines and many niceties that some take for granted. The extra tax money will be a hardship that is imposed on them. In addition, without substantive data to prove it, i very much doubt that the cost of energy consumed to take down and to rebuild an entire building can ever be recovered in lower utility bills even over the thirty years of the bond payments. Because they haven’t demonstrated that they’re taking the larger economic context into consideration and they haven’t (to my knowledge) stated the economic assumptions they’re making with regard to future property values or stated a contingency plan in the event of a drop in those values. #@8: The cost to property owners, while relevant and important to consider, is less relevant than the affordability to the district that collects the revenues. When property values drop and tax revenues follow, the entire system will be put at risk. The alternative would be to somehow reduce costs: wages could be lowered, staff could be laid off, hours of operation could be reduced, fees levels could be increased, assets could be sold, branches could be closed. The new, more energy efficient building would only cost less to operate if the total power load is less than the current building. With the new features and spaces added, it’s not likely that that will be the case. I posed that question on a previous thread and haven’t seen a response, likely because it can’t be answered until the proposed building has been fully designed. The low cost per taxpayer, coupled with a desire for improvement, is a pitfall that will make the district even less able to provide the services that proponents of a new building say are important to them. Mike ‘No Bid Contract’ Garfield and Ray ‘Giant Ugly Water Fountain’ Detter? Why does this not surprise me? Another cost-cutting option, of course, would be to default on the bond payments. Interest rates are that low for good reason: it’s risky to borrow in this economic climate, i.e., a credit bubble. The private sector in the US is deleveraging at an unprecedented level while the public sector continues to increase debt levels. Interest rates will remain low while that deleveraging (i.e., deflation) plays out over the next few years. Being in debt during deflation is a situation to avoid if at all possible. We would be much wiser to wait until the bottom and then see what we can afford as a community. I have now read through all the materials that both sides have provided. I have also seen whose houses sport what signs and the list of people supporting each side (very telling, and quite expected, I might add). Not that it matters to anyone, but I fully support the bond proposal to build a new library and now have placed a sign indicating that support in my front lawn. I still believe it will pass quite easily. Sheila, I want to respond to your question, and thank you for asking it. I think categorizing into “needs” and “wants”, as you’ve done, is a difficult thing to do. All of these things that would be possible in a new building help serve the library’s mission of developing literate and informed citizens, and I think furthering that mission is a “need”, and hardly specious. Would adding CDs and DVDs to the collection have seemed like a need or a want in the mid nineties? What about adding computers? I think the library must continue to innovate and improve over time, and not simply be content with fixing the plumbing. Really, it will be up to the voters to choose which path to take, and weigh the costs and the benefits. While this issue might have been more contentious than many anticipated, I’m heartened to see everyone looking out for this community, although from different viewpoints.